In Man on Fire, Stephen Kelman tries to pull a novel out of this Youtube curiosity in an act that is ultimately unfair to BB Nayak’s impressive life. 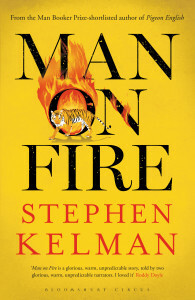 Kelman loosely fictionalizes Nayak’s very-real history but situates his biography in a misguided novel about an aged British man named John Lock who leaves his wife Ellen in an effort to find some kind of spirituality in India under BB’s guidance. Lock’s chapters clunkily shift into a strange second-person narrative, addressing “you”, as if the entire novel is a confession to the God he never thought he believed in. With additional sections narrated by Nayak himself, recounting various world records he obtained with both the Guinness and Limca committees, Man on Fire aims to be a book about perseverance, both physical and spiritual, and the enlightenment such hardship might bestow upon a person. 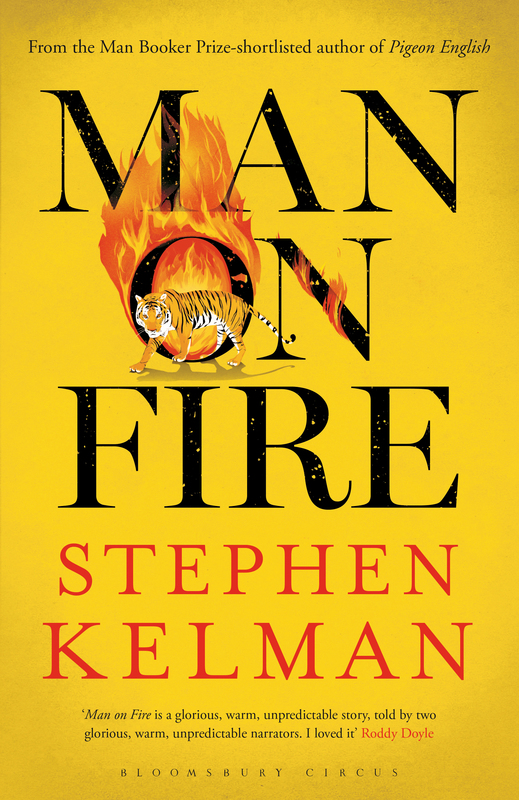 Just as Nayak and Lock pull Man on Fire between a novel about faith and something far more off-putting, Kelman’s prose is routinely yanked from its path. The majority of Man on Fire is composed of short, choppy sentences: “Ellen wouldn’t have known what hit her. At the time I thought there was mercy in that. I thought I was doing her a favor.” This truncated, accessible prose will surely broaden Kelman’s readership (his 2011 Booker-shortlisted Pigeon English is already in some pre-collegiate classrooms), yet there are bolts of confounding poetic turns that befuddle more than they dazzle. In one early scene, he and BB visit a monastery full of ping-pong playing monks, where a matchwinning shot was “a forehand rocket that went through a wormhole and came out the other side covered in slime from the birth of the universe.” These richly-rendered, meaningless descriptions resurface often. In one scene Lock recalls a time back in England where he would “go out into the garden and X-ray specs the bones of all the animals buried there.” In another, “the women in the crowd posed in shapes of grace, steadied their hands to catch the eggs from upturned nests when the sky started falling in.” These uneven moments are further distractions in an already muddy novel. It is difficult to read Man on Fire without imagining what another author would have done with Bibhuti Nayak’s story. At times the novel feels less about his life than it is about his novelty: Nayak’s forays into journalism and Bollywood are only touched upon in brief Nayak-narrated episodes and they feel like obligatory inclusions on the way to more accounts of his physical performances. But even then, Lock’s crisis of faith and abandoned wife overpower much of Man on Fire’s drama and clutter the later portions of the novel with vitriol and befuddlement. Although well-intentioned and deserving of accolades for introducing western readers to Nayak, Man on Fire ultimately feels like a misguided, squandered effort.